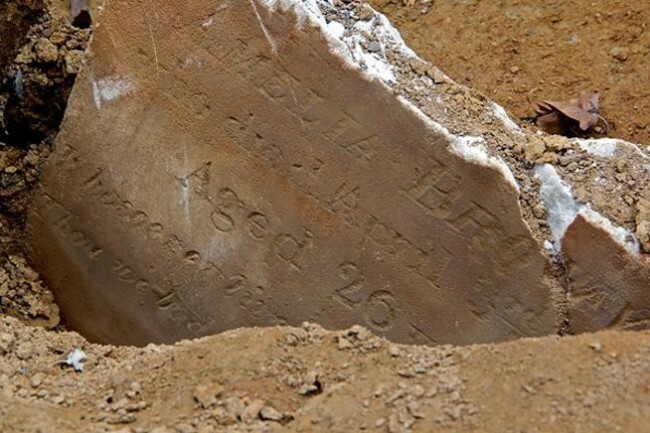 Two-year-old Margaret Jane Smart died this date, April 20th, in 1851 of “Convulsions”* and was buried at Bethel Burying Ground. Her parents were Mary Smart and her late husband Charles, according to the 1850 U.S. Census. Ms. Smart was 38 or 39 years old at the time of her daughter’s death. Mr. Smart died 18 to 19 months before Margaret Jane’s death. His death certificate is below. He died of Cholera at 35 years old in September of 1849. Employed as a laborer, he had lived in Philadelphia for fifteen years at the time of his death. He likely was born in Delaware, as was his spouse, according to the 1850 U.S. Census. Two-year-old Mary Jane died on Mary’s Alley. A narrow, dark plague spot, where it isn’t surprising to find the dead, but it is a surprise to find the living. Ms. Smart lived with her children in a room or part of a room for which she would pay $0.25 to $0.75 a week in rent. The 1847 Philadelphia African American Census reports that, for several years, there was sickness in the family for which they received medical attention at the local public clinic. Mary Jane Smart is one of the 919 babies two-years-old and younger who have been identified from surviving records as having been buried at Bethel Burying Ground. Mary Jane Smart was buried at Bethel Burying Ground on a rainy, overcast day where the temperature reached 56 degrees in the afternoon. I was unable to find any further mention of Ms. Smart in available records. Debility is not a cause of death. The decline in Ms. Williams’ health was secondary to an undiagnosed illness. The red pin indicates the location of Ms. Williams residence while the red arrow indicates the location of Bethel Church. The above is a 1910 photo of the block of Lombard Street in which Ms. Williams resided. The wooden frame building she lived in had long since been replaced by a brick structure. Ms. Williams is not mentioned in any censuses or city directories, so we don’t know where she was born in 1754. No matter, it is highly likely she was born to enslaved parents. In 1780, Pennsylvania passed the Gradual Abolition Act which established as free those children born to slave mothers after that date. They had to serve lengthy periods of indentured servitude until age 28 before becoming fully free as adults. Emancipation proceeded and, by 1810, there were fewer than 1,000 slaves in the Commonwealth. None appeared in records after 1847. The stillborn son of Sarah and Abraham Field* was delivered this date, April 11th, in 1842 and was buried at Bethel Burying Ground. Ms. Field took in wash and ironing, while Mr. Field earned a relatively good take-home pay of $8 a week as a waiter. They lived on Christian Street between 8th and 9th Street in the Moyamensing District of the county. They paid a hefty $6.60 a month for rent, according to the 1847 Philadelphia African American Census. Both attended church services and belonged to a beneficial society. Above is a circa 1920 photo of the same Christian Street block where Mr. Field lived and had his small grocery store in 1865. By the time of the photograph, the neighborhood was mostly Italian immigrants. Abraham Field died at the age of fifty on May 9th in 1869 and was buried at Lebanon Cemetery. His obituary below is from the Christian Recorder, May 22, 1869. Mr. Field was active in local civil rights efforts and was a steward and Sunday School teacher at Bethel A.M.E. Church. Later in life, he opened a small grocery store. Thirty-seven-year-old Joseph Edwards died this date, April 8th, in 1849 of Tuberculosis and was buried at Bethel Burying Ground. The 1847 Philadelphia African American Census reports that two years before his death Mr. Edwards was too ill to work. The Census also shows that Ms. Edwards* was employed as a nurse and another member of the residence was employed as a domestic earning $1.50 a week. The Edwards and the unidentified woman lived in a room at #8 Madison Court for which they paid $3.50 a month. Madison’s Court was a slum within a slum. This dead-end alley branched off St. Mary’s Street which had a wide reputation of being the worst-of-the-worst living environment in the city of Philadelphia. The sun never shone in the ill-ventilated rooms of these tenements. This made it a perfect haven for deadly respiratory diseases, such as Tuberculosis, that killed Mr. Edward. Eleven Black families totaling forty-five men, women and children lived on small Madison’s Court, according to the 1847 Census. No one would choose to live here. Historically, this neighborhood was one step away from the House of Refuge and its adjoining potter’s field. And yet, Mr. Edwards’ family made sure that he had a dignified burial at a respectable cemetery. *There are a number of individuals with the last name “Edwards” buried at Bethel Burying Ground. There is some evidence that points to the possibility of Harriet Edwards being Joseph Edwards’ spouse. She died at 40 years old of a lung infection on February 22, 1851, and likely was buried next to her husband. Fifty-year-old Sarah Westwood died this date, April 5th in 1853, of Apoplexy (stroke) and was buried at Bethel Burying Ground. Ms. Westwood, a widow, was born in Accomack County, Virginia and was the daughter of Irvin and Betty Midad. They very likely had been enslaved. According to the 1852 and 1853 city directories, Ms. Westwood was occupied as a wash woman. Ms. Westwood lived in a room at #6 Osborn’s Court for which she would have paid approximately $2 a month. She likely earned between $.75 to $1.25 a week doing laundry. Osborn’s Court was a two block long narrow thoroughfare near 8th and Walnut Streets. The red pin in the map above shows the location of Osborn’s Court located near both Pennsylvania Hospital, founded in 1751, and Washington Square. Osborn’s Court is now named Darien Street. 1912 photo of Darien Street, formerly Osborn’s Court. Ms. Westwood was 50 years old when she died. This was seven years more than the average age (42.3 years) of the adult* females buried at Bethel Burying Ground. The average age for males buried there was 42.9 years. Ms. Westwood was buried on a day that started out rainy but turned fair by 9 am. The temperature rose to 50 degrees. *All females 16 years of age and older. Thirty-four-year-old John Goodin died this date, April 3rd, in 1853 of Debility and was buried at Bethel Burying Ground. Debility is a symptom, not a cause of death. This condition could follow numerous chronic and acute illnesses. The 1847 African American Census reports Mr. Goodin was employed as a porter, earning a relatively good wage of $6 a week. His unnamed spouse worked as a wash woman. Also living at 320 Cedar Street with the couple was a child and two other unnamed adults. The monthly rent was $7.50. In addition, all four of the adults belonged to a beneficial society. Mr. Goodin may have been employed at the South Street Distillery two blocks from his home. This business was known for its own brand of Rye Whiskey. The above illustration shows porters hauling material to and from the business. John Goodin’s death certificate was signed by William and Henry Goodin. It appears that they might have been John’s brothers. According to the 1850 U.S. Census, Henry Goodin was a 32-year-old laborer who was born in Maryland. He was married with three children. His youngest and the only boy was named “John.” Information on Henry Goodin is slim. In the 1852 City Directory, there is someone with that name residing at #20 Middle Alley and occupied as a tailor. By the time of Mr. John Goodin’s death, he lived on St. Mary’s Street near 7th Street. Known by both races as the “heart of the slums,” it would have been quite an economic fall for the family. St. Mary’s was a narrow thoroughfare lined with dilapidated hovels that were home to speakeasies, prostitution, gambling, and rooming houses that were overrun by rats. In addition, St. Mary’s Street was a perennial target of white mob violence, especially in 1840, 1842 and 1849. Mr. Goodin died on a cool rainy day in early April where the temperature only rose to 48 degrees. Interestingly, a year later, a John Goodin, Sr., age 70, would die of a brain disease. It is unknown if they were related. Both were buried at Bethel Burying Ground. Thirty-one-year-old Robert Carson died this date, March 26th, in 1841 and was buried at Bethel Burying Ground. Thirty-one-year-old Robert Carson died this date, March 26th, in 1841 of the deadly effects of a “Lumbar Abscess.” He lived on Broad Street, just below Arch Street. The 1837 Philadelphia African American Census shows that Mr. Carson was employed as a porter. He was married and there were five others in the family besides the couple. The ages, genders or relationships of these five individuals are not reported. All seven in the family were born in Pennsylvania. Ms. Carson’s first name was not reported. Her occupation is recorded as “own work” which I take to mean homemaker. The Carson family lived in a room on Broad Street, just a block north of Penn Square which is now the location of Philadelphia’s historic City Hall. In 1841, it was a large public square. The rent for their room was $4 per month, according to the 1838 African American Census. Mr. Carson probably made $4-$5 a week as a porter, most likely at the warehouse of E.G. Dutilh & Co., located directly across Broad Street from his home. Tragically, Mr. Carson’s nine-year-old son, Simon, died six months after his father of brain inflammation, possibly meningitis or a similar virus. The child’s death certificate was written on a greasy piece of paper, perhaps from a paper bag. Both father and son are buried at Bethel Burying Ground.